So Shaun, you’ve just got copies of the first book you’ve ever published in your hand. What does that feel like? Wow, what a question! Relief I think! It’s been a long process, and it feels so good to finally see the fruits of everyone’s labours that have gone into this book, and to feel that it can now go out and be a help to people. And I can’t get over how much I love the cover design – we spent ages getting it right, and I’m totally in love! I think it’ll be a while before it all sinks in. (Below is a short promotional film for the book produced by Green Books). Can you give us an idea of what ‘The Transition Timeline’ is about, and how it differs from ‘The Transition Handbook’? Ok, well the book is in two halves. The first half lays out four realistic visions of the history of the next twenty years, in the UK and the wider world, covering the range of possible responses to the challenges we face. Then it takes the most desirable of these, the Transition Vision, and examines it in depth, fleshing out key areas like food, energy, population, healthcare etc, to provide a sense of context for Transition initiatives visioning a positive future for their own communities. The third section you know better than me, since you wrote it, but it explores how Transition initiatives can use the book to support their Energy Descent Planning process, and looks at what pioneering communities have been doing since the Transition Handbook came out. provides a lot of information from authoriative sources that should be useful in dealing with sceptical individuals or organisations in Transition Towns. Tell us a bit about yourself. What has been the journey that led you to sitting down and starting to write this book? Well I used to run a learning centre for marginalised groups, primarily working with drug misusers, asylum seekers and people with learning difficulties. I loved that work, but I was learning more about climate change and peak oil in my spare time and eventually got to the point where I felt working to help people reintegrate with society wasn’t the most useful thing I could be doing if society itself was heading off a cliff! So I left my job and started living very cheaply while researching what I might be able to do to make a difference. In 2006 I attended the two-week Life After Oil course at Schumacher College, which is where I first met you, David Fleming, Richard Heinberg and others, and decided that Transition Towns and Tradable Energy Quotas (TEQs) felt like big parts of what we need to build a better future. Since then, working to help support and develop those ideas has been the focus of my time and energy, and the book grew out of that. In 2007 Transition initiatives were feeding back to the Transition Network that they needed more input on the big trends that were likely to affect their communities over the next twenty years, and that was the initial brief that you guys gave me for what eventually became this book. I made the mistake of then asking lots of transitioners what else would be useful to include, which is why the project took about a year longer than we originally expected! How has your work around Transition affected how you live your life on a daily basis? What do you do differently now? Well right now I seem to be spending every moment writing or talking about this book, but perhaps that isn’t quite what you mean! I suppose for me awareness of peak oil and climate change has been shaping my life for the best part of a decade now, as we discussed, but the key contribution of Transition for me personally has been pulling me away from my dangerous instinct to approach everything alone. I spent too long on my own reading incredibly depressing information on the internet and not really having any peer group around me that I could share that with, and I didn’t really know what to do about that. Nowadays I meet weekly with my local Transition Steering Group and am always involved in arranging events, plotting future projects and discussing things with others who share a similar understanding of the challenges we collectively face. what was then a very young idea, and wondering where it might go..
One of the key threads of the Transition Timeline is the need for new cultural stories and narratives. Can you tell us a bit more about that? Yes, my personal education was actually in philosophy, and although I see climate change and peak oil as probably the biggest forces shaping our future, I am always struck by the fact that in a sense they are only symptoms of something deeper – they are consequences of the choices we have collectively made and continue to make, and those choices are shaped by our understanding of the world and of what is important to us. choices guided by any of these narratives are likely to create a very desirable future. The sections in the book about peak oil and climate change are very thorough. Clearly they involved a lot of research. What did you find out through that research that was new to you or that came as a surprise? Hmm… I think probably the most interesting concept that was a real revelation for me was the insight that while peak oil is essentially a problem of flow rates and not ultimate reserves, climate change is essentially a problem of ultimate total emissions. There is a difference in impacts based on when emissions take place, but it is not the key consideration on the timescales we are considering. For me, nailing that helped a lot in thinking through how the two problems interact. What would be your 10 second elevator pitch as to why people reading this really need a copy of The Transition Timeline? If you’re planning to live in the UK, or even in the world, over the next twenty years, this book will tell you what to expect. And how to make it better. 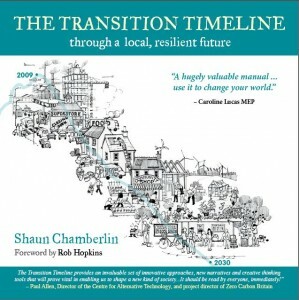 The booklaunch for ‘The Transition Timeline’ takes place tonight at 7.30pm at the Totnes Bookshop, High Street, Totnes (next to the Civic Square). Copies of the book can be ordered here. Just wanted to email Shaun but am unable to get his email address off his dark optimism website. Do you have it avaiable? Finn, not sure why Rob’s link is so strange, but you can buy the book here. I had no probs buying TT and I’m busy inwardly digesting. So far its stimulating and imaginative and will add to the transitions momentum. However, it is also deficient in much the same area as TH: there is no coherent anlysis of capitalism. There’s the odd critical comment and the nod towards the ineffectiveness of “business as usual”. But, we’re still left with this huge catastrophic change in the material pre-requists for “modern” society(oil and every other kind of resource depletion or overshoot) and viturally no critique of the defining organising principle of the now global epoch (c1750 onwards): private ownership of the means of production, distribution and exchange. Is it not private ownership of resources and assets, their concentration in fewer and fewer controlling hands and the internal logic of production for profit that is driving human society towards its fall? Is not the transition to a low carbon, more local, resilient, sustainable society also a transition to a different defining organising principle, otherwise we are locked into the old thinking, the same thinking that got us into this mess and “business as usual”. I’ve had a go in the forum starting off the vision 2027 in this area but it needs more collaborative work, development and comment.